New from Hornet Products. 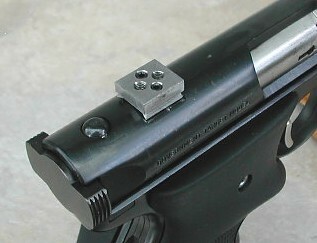 If you have and a Ruger MKI, MKII that's not drilled and tapped you can install this SCOPEMOUNT without making any permanent alterations to your favorite pistol. Remove the rear sight, insert the threaded dovetail filler and install the mount with the screws provided. Accepts all Weaver-style rings and accessories. Kit includes Mount, stainless steel insert, four (4) set screws, and installation instructions. Dimensions: 5-1/4" long, black matte anodoized finish, weighs 2.5 ounces. Mount is the new design with 10 slots instead of 4 as pictured.